Epic Mickey is Junction Point’s thank you letter to Walt Disney. The life’s work of this legendary creator is on display throughout the game’s museum-like worlds. As Mickey’s adventure unfolds, he bounds through the black and white cartoons that put both him and Walt on the map, explores Disneyland’s most recognizable landmarks, and even takes a second to gaze wide-eyed at a bronze statue of Walt. As a tribute, Epic Mickey hits most of the right notes. After soaking up the nostalgic sights and sounds, I tracked down and watched old Mickey cartoons. Thanks to this game, I’ve developed an appreciation for Oswald, the Lucky Rabbit. For those of you not up to speed on Disney trivia, Oswald is the first character created by Walt. 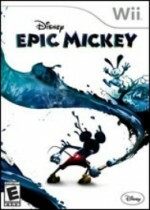 Due to copyright issues, he was shelved and forgotten until his revival in Epic Mickey. Watching Mickey and Oswald interact is one of the game’s most surprising allures. Mickey is mischievous, yet ultimately innocent. Oswald is the exact opposite. He’s bullheaded, and most of his dialogue expresses a harsh cynicism. Though they only share the screen mostly toward the end of the adventure, it’s worth the journey for Disney devotees. The game begins with Mickey sneaking into a wizard’s workshop and accidentally spilling paint thinner on a miniature world. As the thinner spreads, Mickey is pulled into this peculiar land. He sees that it has been turned into a wasteland, sapped of its life and color. After spending a few minutes here, Mickey realizes that he’s standing in a twisted version of Walt’s greatest creation, the Magic Kingdom. The residents of Main Street are miserable, the rides in Tomorrowland are malfunctioning, and Mickey’s accident is to blame. He has to clean up the mess, and the task won’t be easy. The thinner has taken on physical form, and continues to corrupt the land. Epic Mickey clings tightly to one cool gameplay gimmick – Mickey’s ability to apply paint and thinner to the environment. Channeling a little magic like he did in Fantasia, Mickey wields a magic brush that can spray mighty streams of both paint and thinner. Paint revitalizes objects. Thinner removes them from the world. With one flick of his wrist, Mickey can transform a dilapidated house on the verge of collapse into a pristine work of art that shines with life. He will also be forced to temporarily remove objects from the world to gain access to areas that will help with the repair. For instance, spraying thinner on a rooftop will give him access the interior of the building. When his task is completed, he can restore the building with a blast of paint. Junction Point uses this paint and thinner mechanic to create a variety of clever puzzles and combat scenarios. Objectives are rarely clearly telegraphed, which leads to paint and thinner being tossed around liberally. The hunt for solutions is the heart of Epic Mickey’s gameplay. One spray of thinner could reveal a secret area, and a blast of paint could reanimate a machine that changes the complexity of the entire level. While combat encounters are few in number, most of the foes Mickey squares off against demand different attack strategies. Blotlings, creatures infected and/or created by Mickey’s thinner disaster, melt into a puddle if you pour thinner on them or become docile if you splatter them with excessive amounts of paint. Beetleworx enemies require thinner to expose their weakness, but can only be finished off with a spin attack by Mickey. Some enemies roll at you, forcing Mickey to leap into the air, and quickly spin around to establish another steady stream of thinner. No matter what creature I was squaring off against, the battles proved to be exciting tests of skill and precision. All of this spray functionality is handled beautifully on the Wii remote – just aim and shoot. Fans of Super Mario Sunshine should feel right at home. While offering exciting propositions for both combat and exploration, the entire experience is plagued by an uncooperative camera. As Mickey strafes around an enemy, the camera could catch on a wall, causing it to lose frame of the action, or freak out to the point that it’s impossible to gauge what is going on. The platforming segments, which send Mickey up perilous towers and across moving contraptions, are marred by the camera tracking, sometimes locking in a position that blinds you for the next jump. The camera can be realigned and the player can also zoom into first person, but sometimes the game just won’t let you alter the angle. Frustration abounds in almost every world. This is a shame, as the worlds are teeming with well-hidden secrets, such as body parts to construct bizarro versions of Donald, Goofy, and Daisy. With the camera working against me, I often felt the secret wasn’t worth the effort. Death often means you have to start an entire level over again. As much as I loved the artistry in the worlds and the general vibe of the game, many of the missions Mickey is sent on are the very definition of mundane. Miserable talk-intensive fetch quests periodically rear their ugly heads, and challenges like “shoot the glowy bits on seven passive thinner tentacles” do little to get the blood pumping. As imaginative as the worlds are, the quests feel tacked on, and sometimes come across as time sinks to extend the length of the adventure. The end result is a game that offers fun gameplay mechanics that are sapped of life due to the mind-numbingly boring nature of the quests. The power to restore or destroy directly affects the land and slivers of the story. Within almost every mission, Mickey's actions can have a positive or negative effect on the kingdom. Both choices bring different results, much in the same vein as the Fable series. If Mickey is heroic in his crusade, his physical appearance becomes that of a stalwart knight. If he does everything he can to darken the world, the thinner corrupts his body to the point that the color from his skin drips off of him like a leaky faucet. Unfortunately, most of the choices don’t hold much emotional resonance. This is largely due to the limited amount of time given to the characters and world. Sorry, cow lady, I know I ruined your garden, but you look just like everyone else in this world, and your five word plea wasn’t enough to convince me otherwise. I got a kick out of the side-scrolling levels, which turn Mickey’s oldest and most memorable cartoons into fun (albeit challenge-free) platforming sequences, but getting to them meant slogging through the larger worlds. Epic Mickey goes out of its way to show gamers Walt Disney’s body of work, but rarely fires on a level that turns this beloved content into exciting gameplay.